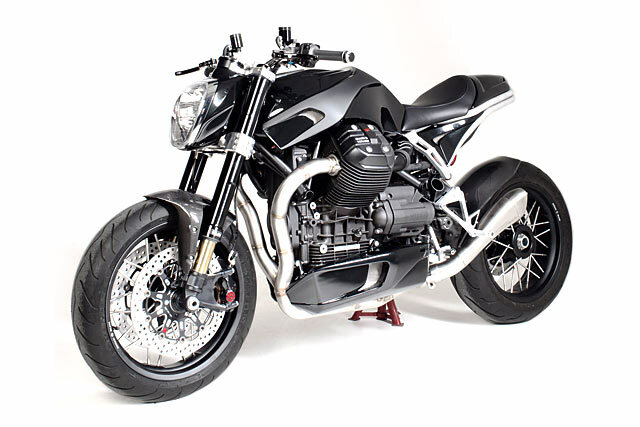 ‘Millepercento,’ or ‘One Thousand Percent’ in English, is a company that buys Moto Guzzi engines and drivetrains from the factory and then builds bespoke new bikes on the existing technology. 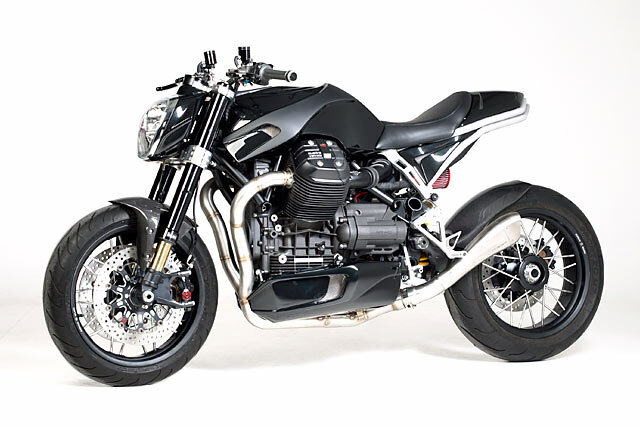 The ‘Alba’ was designed by Giuseppe Ghezzi, and ex-Guzzi designer, specifically to address a yearning he had to make a Moto Guzzi sportsbike. 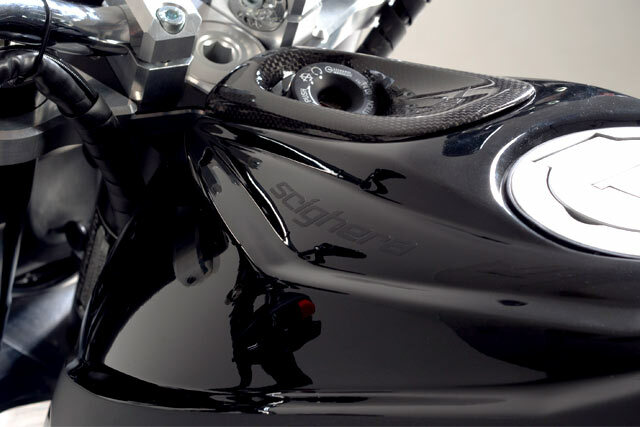 And with the MGS-01 racebike already in his very impressive portfolio, you can probably see why. But where does Filippo and his Office Rossopuro fit into all of this? Well, as weird as it may seem, Filippo’s was asked by Millepercento to design and build a bike for them. 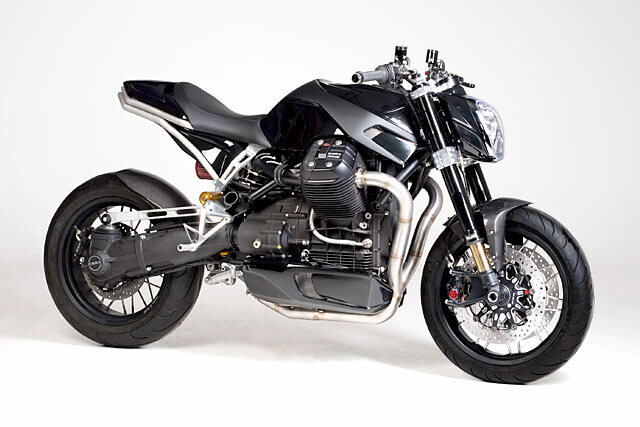 So in essence, what we have here is a custom bike based on a limited run of hand-made racing bikes which themselves were based on a bike from the Moto Guzzi factory. It’s like that Inception movie, but with Italian bikers. And loads more moustaches. “The name ‘Scighera’ means haze or mist in the Milan dialect,” says Filippo. And for good reason, too. “While it was complete and ready to ride quite a while ago, it’s been garage-bound due to new Italian pollution laws.” Heard the term ‘vapourware’ before? Well, now you’re actually looking at it. 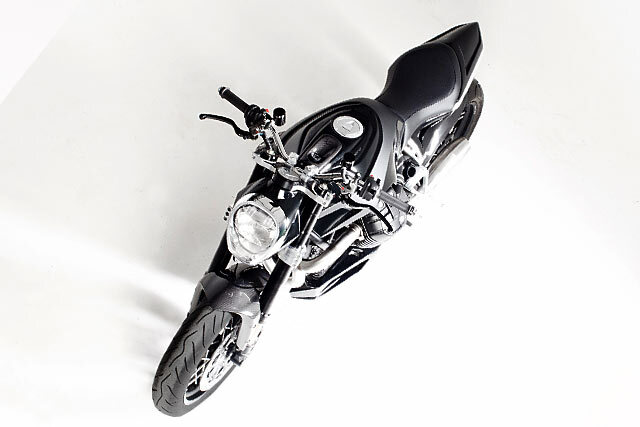 Filippo continues, “There are very few custom bikes that are born without a strict brief and a worried customer to bankroll proceedings – yet Scighera is in fact one of these.” Delve a little deeper into the story and he’ll tell you that the bike you see here was created without sketches or models. In fact, the lines of the bike were derived from solid materials that have been cut and worked to obtain their final forms . ‘Like creating a shape from a solid block of stone,” says Filippo. Reminds us of another famous Italian who was also a rather talented designer. Of course, Filippo’s real challenge was to build something light and sporty from a base bike that was anything but. “So you will see a large predominance of aluminium materials, components and structural parts,” he says. 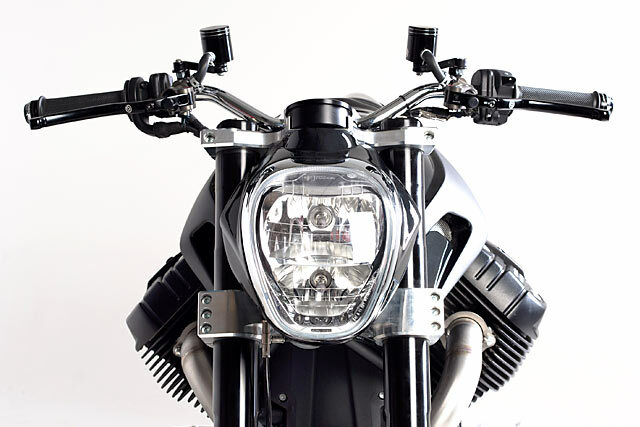 “The other key parts are made of carbon fibre.” As the proud black sheep of the Guzzi family, this ‘sister of Mandello’ couldn’t be more dissimilar from the rest of her kin – wheels included. And here comes even more Aluminium: the rear frame support, the triple tree clamps, the top plate to flush mount the new instruments. All bauxite-born beauties. Elsewhere, the handlebars have been divided into two parts, so that the inclination and height are all fully adjustable. And down below, the oil cooler is now placed behind the engine and then fed with two side-mounted air intakes. “Surprisingly, this position also allows for excellent cooling,” says Mr. Barbacane. 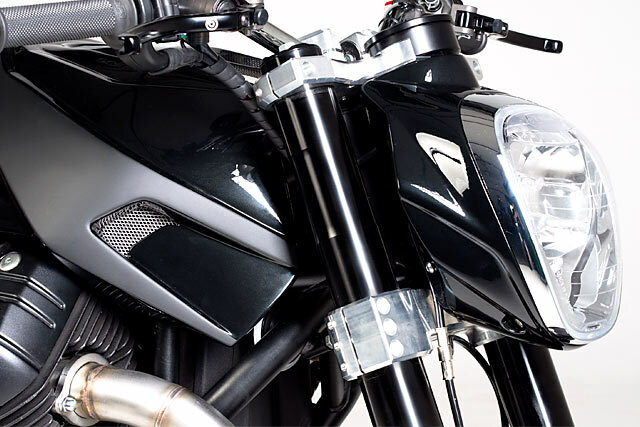 “And the visual effect is to really clean the bike’s lines up.” Nearby, the bike’s exhaust manifold is a 2-into-1 system designed by HP Corse and features a hydroformed end section with a beautifully organic ‘swoosh’ to it. The braking system is from Brembo, while the front forks are 48mm Ohlins units in a shiny black disguise. At the rear is another Ohlins unit, but this time it’s an adjustable monoshock that retains the brand’s gold hues. And while your eyes are loitering in the general area, look for the bike’s air filter sticking out from the rear of the frame. For Filippo, the hardest part of the bike’s build was relocating the oil cooler to its new home under the engine. ‘It caused a lot of head scratching,” he quips. And his favourite part of the bike? “The motorcycle is one of the best designs I have ever built. Why? Mainly because I think it’s very hard to build a modern motorcycle with a real retro feel to it. It’s very hard, but I think I succeeded.” You’re not the only one, Filippo.